Gathering all together, this Tower specializes in merchandising mugs just at the entry to JCPenney Glassware. Atop, a Mug Table Stand Tops Glassware Display providing a focus and instant communication from a distance. The “hero” set is appealing in itself, though much of the balance of the offering is mix-and-match. Sets are nice as decoration. Mismatched groupings better for remembering who’s using what cup. 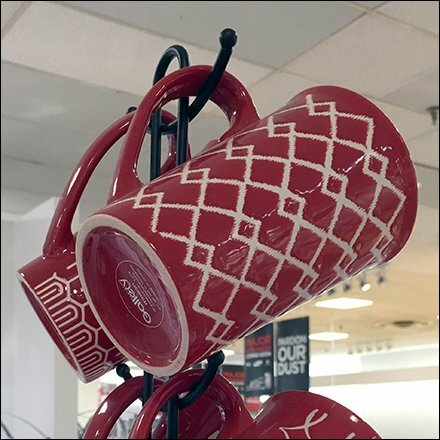 This Mug Table Stand Tops Glassware Display and the tower display seen at JCPenney.